Martin Rushent's Linn Drum programming on this is some of the most inventive and creative bar Trevor Horn's arrangements for Propaganda. Texturally the drum machine is centre stage and the songs seem to be built around these rock solid electronic rhythms all except for 'Lady Ice..' and 'Best Kept Secret'. The massive sounding 'Key To The World' just booms with that huge drum sound. Special mention also goes out to "Let Me Go" probably the first pop production to use the embryonic Acid sound of the Roland TB303. 'We Live so Fast' is all about those syncopated Linn drums again, with a decent side order of sparkling chrome synths. I find the lyrics of 'Come Live With Me' a little dodgy, but the tune is great. What I do like with some of the lyrics is the thinly veiled swipes at the horrors of capitalism and consumerist societal traps. All in all this is a great 80's album which has really stood the test of time and another testament to the genius of Martin Rushent's unique production style. This and 'Dare' and to a lesser extent 'Love And Dancing' make up some of the best electronic music of that era. I love this album. I think who'll stop the rain and Let Me Go are my favourites. Its really worth putting it on and leaving it on, one of those albums that grows on you. Some beautiful vocals on this too. 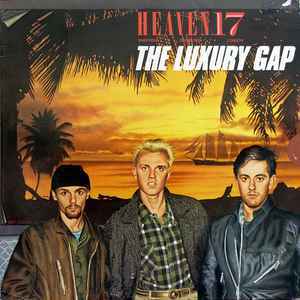 "The Luxury Gap" is definitely a moment Heaven 17 were waiting for and made it big. While their debut album was still bravely crossing over into pop and experimental territory the principle core duo of Marsh and Ware pioneered when in The Human League, their second album brushed all the rough edges and delivered a stunning collection deservedly remaining in the ears (and hearts) of many. Because, it is a true "greatest hits" collection - from "Crushed By the Wheels Of Industry" all the way through to the album's grand finale that is "The Best Kept Secret", there is this invisible yet nicely consistent storyline. While in their later years, Heaven 17 sadly lost (or simply, they willingly dropped) their electro-pop ideals for their white-soul pretenses, the group's first four albums plus "Endless" do provide an impressive catalogue, with a sophisticated pop pedigree. Also a shame the "We Live So Fast" is culled from Endless, so you get Sanny-X Megamix outro beats speeding up and overlaying the start of the 12" version. Also this track, and "Who'll Stop The Rain" seem to fade-out a little too quickly. Shame that the Temptation 12" mix doesn't have the scream at the beginning that made me jump the first time I played it on vinyl back in 1983! This version (CDV2253) was originally released on cd in 1983 or 1984, not 1988 as listed. I know because my rich friend had a $2500 Revox cd player and we cranked this out all the time back then. It was one of the first cd to cassette tape recordings I made when cd's first came out.